These tools will help you consistently come up with new ideas and promote content across a variety of platforms. 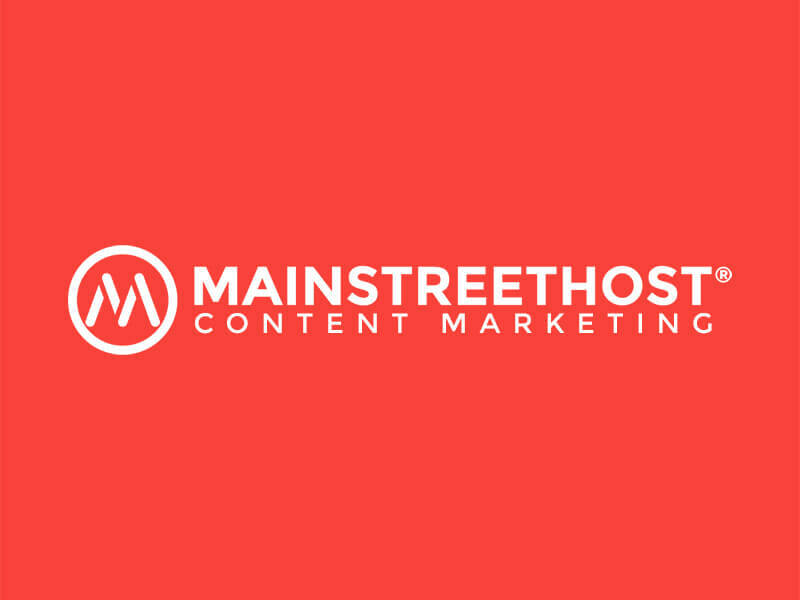 We live in the information age, and that’s reflected in the emergence of content marketing as a significant part of business marketing strategies. Create the right content and you can grow your business organically, as people find it via search engines and social media. Providing valuable content also establishes your business as an authority in its field, enhancing its reputation. However, it’s time consuming to generate content and develop a marketing action plan for that content. If you get it wrong, you could end up investing a large chunk of valuable time on a failed campaign. That’s why it helps to incorporate content marketing tools to strengthen your efforts. One of the most difficult aspects of content marketing is consistently coming up with ideas for new content. 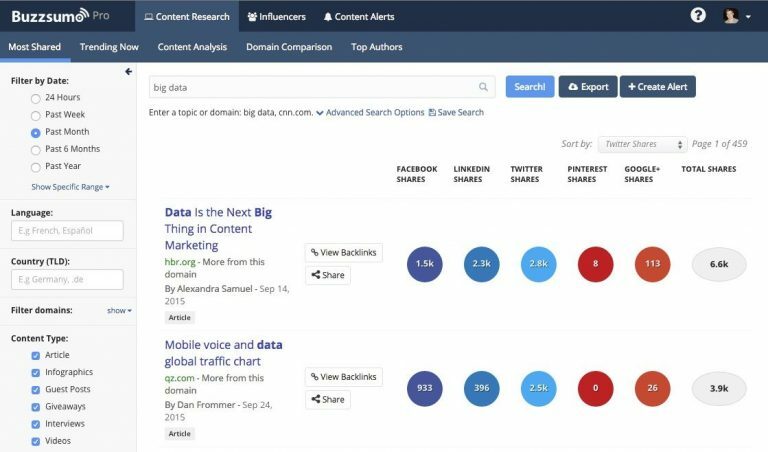 BuzzSumo uses analytics to show you what content is trending and where. You can see what is being shared the most across any of the major social media networks and filter the results by the type of content (blog posts, infographics, videos, etc.). Want to know which topics will get you the best results? BuzzSumo can show you topics related to your business that are the most popular right now, helping you create content that is more likely to trend. This tool’s analytics show you where your advertising is best spent to bring in more of your target audience. It also has information on which influencers are getting the most traction in your market, so you can find the right people to promote your content. Curata is a content curation software that simplifies the process of finding and publishing content. 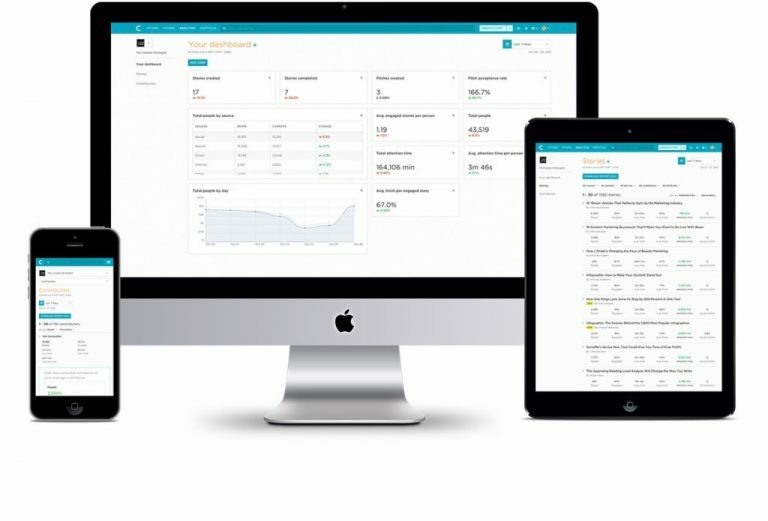 It offers two products: a content creation software and a data-driven content marketing platform. 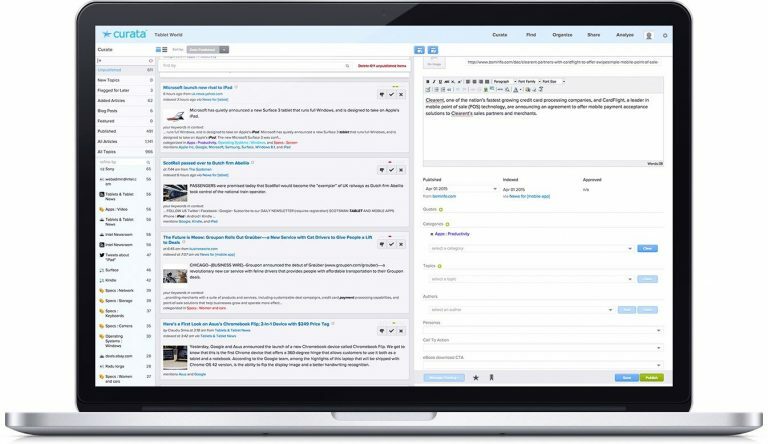 If you’re having trouble sticking to a publishing schedule or curating content, Curata is a huge help. It draws and organizes content from hundreds of thousands of sources, and it has a self-learning engine so you get better results the more you use it. You can publish content you find through Curata across any of your channels in one click. This makes it easy to maintain a steady stream of content without needing to generate the content yourself. Curata also analyzes the results of the content with your audience, showing you the outcome of your efforts and giving you the information you need to update your strategy when necessary. The most effective way to start building your business’ social media accounts is through automation, and when it comes to platforms, it’s hard to beat Buffer’s ease of use and excellent features. Buffer works with Twitter, Facebook, LinkedIn, Google+, Instagram, and Pinterest, so you can manage all your accounts in one place. Posting consistently is a key factor in building a social media following, but that’s also a big-time commitment, especially when you’re attempting to build an audience on multiple social networks. Instead of periodically posting on social media throughout the day, use Buffer to set up a schedule of posts. You can use their Chrome browser extension and mobile app to add content to your queue at any time. Not only does Buffer save you time, it also uses analytics to determine the best times of day to post content. Its Twitter analytics are especially useful, as it checks when your followers are active and analyzes the engagement your tweets get. With the rising number of businesses employing remote workers, managing everyone in a global content marketing operation can be a challenge. Contently helps keep your content marketing team organized, whether it consists of remote employees, freelance creatives, or both. Everyone involved in a project can stay connected and collaborate with in-line commenting, email notifications, and a messaging system. The platform has cloud storage for everything related to your content, allowing you and your team to access it 24/7. Using Contently, you’re able to view assignments on a dashboard, set up deadlines, track progress, and approve content. The platform also has tools for obtaining legal approval of completed content and sending invoices. In addition to its powerful content management capabilities, Contently can provide suggestions to help you generate ideas for new pieces of content. As anyone with content marketing experience knows, the saying “if you build it, they will come” doesn’t apply to online content. Getting your content in front of an audience is a challenge in and of itself. 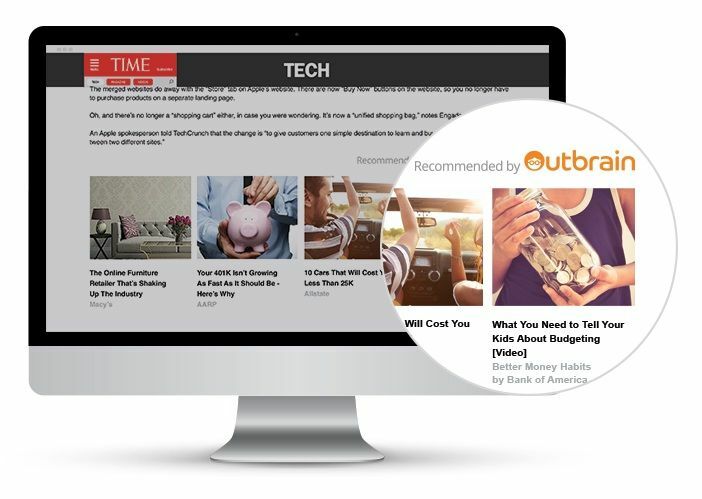 Outbrain is the leading content discovery platform on the web, so it can significantly grow your audience through increased visibility. It is a pay-to-play tool, but if you have the money in your marketing budget, this is a simple and effective way to get your content out there. Outbrain is able to promote just about any type of content you want, whether that’s an article, video, infographic, or something else. Your content is placed on popular local and national sites as a promoted suggestion. When your audience finishes reading an article and are looking for something new to check out, they’ll see a link to your content. There’s only so much time in the day, and with all that goes into effective content marketing, you could easily spend it all on mundane tasks. A more efficient and effective solution is to use the powerful content marketing tools listed above to streamline as much of the process as possible. This leaves you with more time to put towards your overall content marketing strategy. The analytics available through these five content marketing tools are also extremely useful, as they break down what type of content is working well and show you the results of your content. Having more information speeds up and improves your decision-making process, so you can maximize returns on all your marketing efforts. Jill Phillips is a freelance writer from Buffalo, NY. She is an aspiring entrepreneur and tech enthusiast, who loves to share her insight on tech and digital media topics. When she is not writing, Jill enjoys taking photos and taking long walks with her dog. Connect with Jill via Twitter @jillphlps.